First off, thank you so much for your great comments to the last post I did on the Boston Marathon and the possible effects of the wind on Mutai’s amazing 2:03:02. The reaction has been overwhelming – the comments equivalent of a phone ringing off the hook! As has become the norm, the discussion to the post is twice as good as the post, so thank you! I apologize if I haven’t been able to answer all the posts – I do read them, but things are rather busy here in Cape Town with the build up to the Two Oceans Ultra-Marathon this weekend!With hindsight, and with the great discussion we’ve had on that post, I’d say that the one thing I didn’t account for enough in the analysis of the history of Boston is the tactical nature of the Boston race compared to the fast, paced races of London, Chicago, Berlin. Given that factor, I’d probably revise my impact of the wind to about 2%, which would place it around 2:20 to 3 minutes. That would mean that Mutai was running mid 2:05 on the Boston course, which is perhaps a 2:04 or mid-2:03 pace anywhere else, and that of course is realistic for a man who is clearly among the best right now. And like Mutai, there are a few men capable of that, in theory, which is what makes the Fall season so intriguing. But the effect is not as low as one minute, or nothing at all. Moses Mosop’s coach, Renato Canova, has tried to explain the wind away, calling analyses “stupid speculation”. It is of course in his interests to coach a man genuinely capable of a 2:03:06, but I found his analysis full of holes, including the use of runners who ran slower than their PB as “proof” that the wind had no effect. 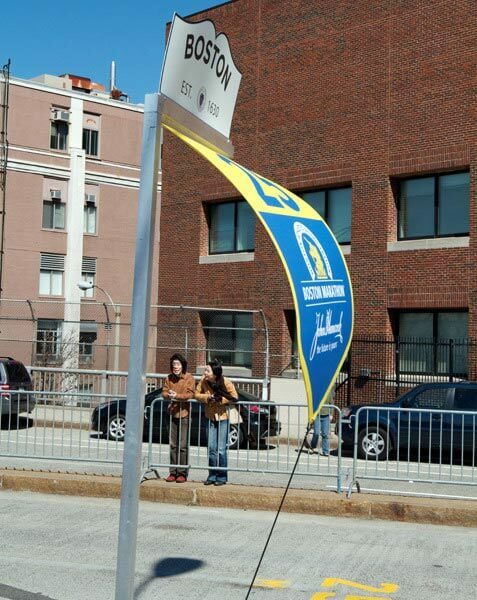 He then works out that on average, Boston 2011 was slower, and so the wind couldn’t have had an effect. This is completely nonsensical, because runners underperform relative to their best all the time – just ask Kebede in London. Or Makau. Or Lel. Or Gharib. Fact is, you set your PB over many races, as a result of the confluence of great training, great form, and a great day. And when you compare one race to a history of races (especially the marathon, where it’s not difficult to go two or three minutes slower – again, ask Kebede and any other marathon runner), you will almost always end up with this ‘answer’. Simply, there is too much variability in marathon running to make this analysis credible. Performing beneath your own ceiling is not evidence that an advantage doesn’t exist, whereas exceeding the ceiling MAY mean it does. There is also the very obvious oversight that not feeling a wind at all doesn’t mean there is zero wind; it means it’s a tailwind equal to the speed of running. Amby Burfoot observed this at the press conference, where most of the athletes said that they felt “no wind”, which is perhaps the most telling observation of all. There is also this justification that the wind switched around a lot and was sheltered by buildings. Of course it would be, but you don’t need a tailwind for 42,195 to have an effect, and no one is basing the calculation on a 20mph tailwind the whole way. The physics calculations we showed assumed relatively low average tailwind of 14mph, equal, on average, to the speed of running. The photo to the right suggests that it was, at times, greater, and I’m sure it would be lower at others. But it was still a net tailwind, in the range of 12 to 18mph, and it had an effect. In any event, the acid test will come later in the year. Let’s see if Mutai, Mosop and even Hall are able to reproduce anything close to their Boston performances without the wind, even on flatter courses. I thought I’d wrap up the Spring Marathon seasons though, and chat about the women’s race, which was yet another one of the ages in Boston, and then look ahead to the Fall, and what may happen there. Neither would have been a recognized favourite before the race. Those went by the wayside very early – defending champion Erkesso was out of it within the first 20km, and then Dire Tune, maybe the big favourite, was dropped soon after 30km by a pace that, it has to be said, wasn’t all that fast. Then it was left to three. Sharon Cherop, Davila and Kilel. None had spectacular credentials – Cherop was the fastest with a 2:22:43 last year, while Kilel, aged 30, had a 2:23:44 to her credit. Davila, meanwhile, has been improving consistently, but with a PR of 2:26 would perhaps not have been expected to outlast those around her. That she did though, and she was the aggressor for much of the second half of the race. In an amazing display of courage, she took the race to Kilel and Cherop and there were times when the elastic between her and the two Kenyans was stretched. But it never broke. Kilel was able to cover all the surges, and the three entered the final 2km together. Cherop would eventually be dropped, and Davila seemed to have run her race when a gap of 5 m appeared and Kilel seemed to be pulling away. But Davila dug deep, caught up and then counter-surged one last time. It was spectacular racing, full of guts, but in the end, Kilel had answers and won by a margin of two seconds. Cherop was only four seconds further back. It was the fourth time in a row that Boston has produced such an epic finish. The victory margins in the last four Boston races have been 2, 1, 3 and 2 seconds. Average margin of victory since 2008 is two seconds! And so if it’s competitive racing you want, Boston seems to have something that produces it among the women. The other thing about the women’s race is that it started very tactically. Kim Smith was almost a minute clear within 15km. By halfway, that lead was 50 seconds. But she wasn’t really going that quickly – her split at the half was 1:10:52, and the main group was almost a minute behind with a dozen women in it. So there’s no question that the women started conservatively, much more than the men, and the overall time reflects that. And finally, I don’t think this women’s field is nearly as strong as what was seen the day before in London. Where would Kilel, Davila and Cherop ranked in a race with Keitany, Shobukhova and Kiplagat? If you say top 3, I’d challenge you on that. Simply put, this was not a super strong field, yet they ran times rarely seen in Boston. As a final word, the wheelchair races were also super quick. The women’s course record was broken – the previous record, you shouldn’t be surprised to learn, was set in 1994, the very windy year that saw both men’s and women’s course records. The men’s race was the second fastest ever, and it came down to a three-way sprint. The upshot of all this (including the debate) is that we have a magnificent fall marathon season to look forward to. Two Mutais, one a winner in London, one in Boston. Emmanuel produced a 28:44 10km stretch to break a field that included Makau, Kebede and Lel. Geoffrey produced a 28:15, albeit wind-assisted to run a minute inside a world record. And so did Moses Mosop, for that matter, in his debut. Improvement with experience…? Still to join the 2011 year is Sammy Wanjiru. Tsegay Kebede underperformed in London, but he’ll be back, no doubt. The Berlin and Chicago races later this year will produce huge racing between what is now one of the deepest and highest quality groups of marathoners ever seen. Will Boston 2011, 2:03:02 change those races? There is a school of thought that the mindset of the elite will be changed by this, that 2:03 is the new 2:04, and that they’ll be more aggressive, more willing to go out in 61:00 to 61:30 for the half. It will certainly be fascinating to see how the elites structure the races. There’s no question that there are currently four or five guys who have the capacity to break the 2:04-barrier. Mosop, Mutai, Mutai, Wanjiru, Makau, Kebede. Plus one or two others who’ve not yet had the opportunity. Will they go out in 61:30, inspired by the belief that a 2:03 is possible? They may, but I doubt it. I think it’s more likely we’ll see the target at 61:45 to 62 at halfway, with the hope that one of these guys can hang on in a 62 to break the world record. I’d love to see the 61:30 or so at halfway. My hypothesis at this stage is that if they do, they’ll blow in the second half, and run a 63, at best, missing the world record. At that level, with things not being absolutely perfect, 1 second per kilometer too fast is, well, too fast, and so expect incremental changes, not the kind of radical leap that Boston produced. And speaking of perfect, it will need absolutely perfect conditions as well – too warm, too gusty, record gone. P.S. And lastly, here are two videos from the race, showing women’s top 3 at 300fps about half a mile from the finish line. Great footage at slow speed, and its interesting to note the mechanical differences between Davila, Hall and the Kenyans. Food for thought…? This post is part of the thread: Marathon Analysis – an ongoing story on this site. View the thread timeline for more context on this post.